THANK YOU FOR PARTICIPATION IN SPM-2018! 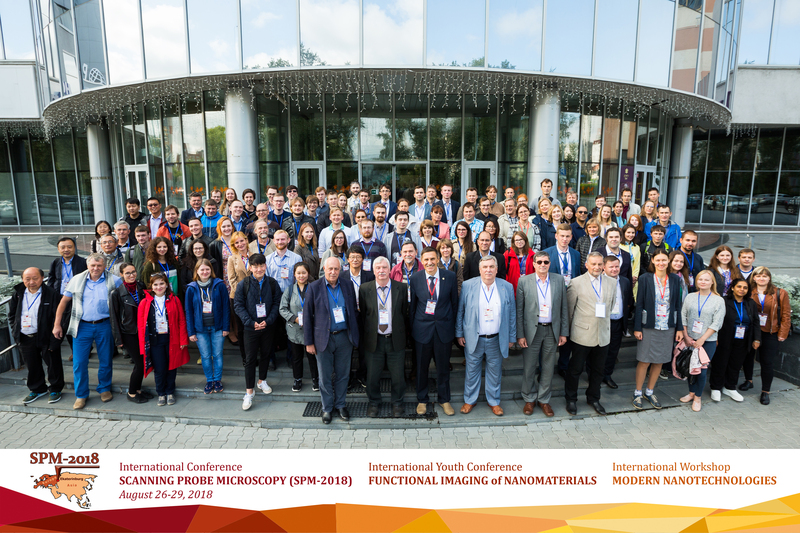 On behalf of the local organizing committee it is pleasure for me to thank all the participants of the International Conference “Scanning Probe Microscopy” (SPM-2018) combined with International Workshop "Modern Nanotechnologies" (IWMN-2018) and International Youth Conference "Functional Imaging of Nanomaterials"! SPM-2018 welcomed about 150 participants from 10 countries and 22 cities of Russia. The conference witnessed 7 industrial, 18 invited, 36 oral, and 108 poster presentations. The proceedings will be published as the special issues of IOP Conference Series: Materials Science and Engineering and FERROELECTRICS journals. Organizing committee acknowledges sponsors and exhibitors: Taylor & Francis, Russian Foundation for Basic Research, NT-MDT Spectrum Instruments, Promenergolab, OSTEC, OPTEC, INTERTECH Corporation, Merck, and IMC. Special thanks to Alexander Lukanin, who sponsored the awards for the best oral and poster presentations of young scientists. You can download the best conference photos here (Google drive) or here (zip file). The abstract book can be downloaded here. I hope that you enjoyed your staying in Ekaterinburg! I invite you to the next conference SPM-2019 in Ekaterinburg on August 25-28, 2019! The joint conference will cover a wide range of topics related to modern nanotechnologies and functional imaging of nanostructured materials by various modes of Scanning Probe Microscopy as well as study of ferroics. The Youth Conference will consist of tutorial session and scientific conference on nanoscale phenomena in different functional materials. The contest for the best presentation of the young scientists will be held.